The Walter Distressed Mercury Glass Table Lamp marries a fresh approach to design with handmade artistry and reliable craftsmanship. Industrial design meets glamorous style in the silver Walter table lamp, featuring a distressed mercury glass finish and dramatic texture. 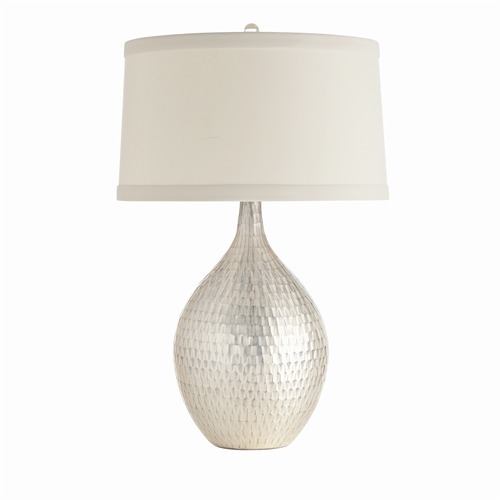 A white shade with a white lining and a clear acrylic finial top this modern light fixture. Includes nickel-plated harp, 8' clear and silver cord and three-way switch for light variation. Accepts 150W max bulb (not included). This product is hand crafted and variations in finish occur.